Collation Centres have started releasing provisional results of the Presidential and Parliamentary elections held throughout the country between 0700 hours and 1700 hours on Tuesday December 7. Krowor Constituency in the Presidential election is as follows:NPP - 28,160 NDC - 25,613; PNC - 403; CPP - 347 The following are the parliamentary results: Mr Abraham Laryea Odai - NPP- 25,405 Dr Nii Oakley Quaye-Kumah - NDC- 24,339 Mr Theophilus Mensah Boye - CPP - 2,808 Mr Emmanuel Boye fio - independent - 945 Mr Theophilus Tei Okunor - independent - 658 President Kufuor had 22,586 votes in the Presidential elections according to provisional results released at Akim Swedru Constituency in the Eastern Region. Professor Mills had 7,813 votes, Mr Aggudey had 197 votes and Dr Mahama, 143 votes. 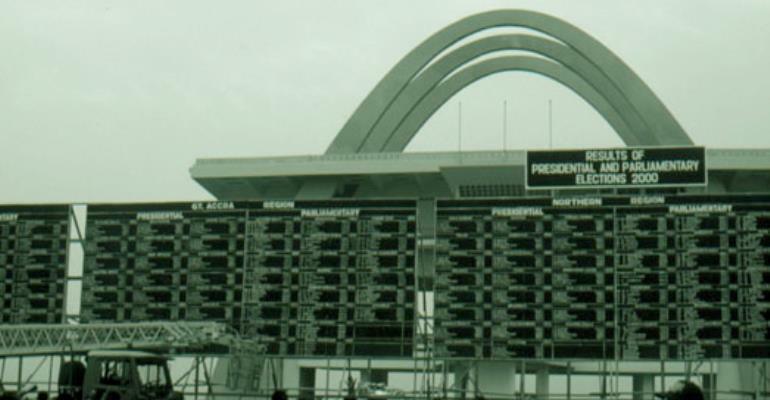 In the Parliamentary, Majority leader and the incumbent parliamentarian Mr Felix Kwasi Owusu-Adjapong had 21,048 votes, Baffuor Mensah Takyi of the NDC had 9,607 votes, Nana Appiah Boateng of the PNC had 191 votes, Mr Edmond Tetteh-Okrah of the CPP had 173 votes and Miss Monica Appiah an Independent candidate, 158 votes. In the Nkoranza South Constituency, President Kufuor had 15,818 votes in the Presidential elections, Professor Mills had 16,813 votes, Dr Mahama had 360 votes and Mr Aggudey, 195 votes. In the Parliamentary, Mr Kwame Amporfo Twumasi of the NPP had 17,665 votes, Mr James Opoku-Worae of the NDC had 16,521 votes and Mr Victor Boah of the DPP, 337 votes. In the Ejura_Sekyedumase Constituency, President Kufuor had 14,920 votes in the Presidential elections, Professor Mills had 17,764 votes, Dr Mahama had 454 votes and Mr Aggudey, 150 votes. In the Parliamentary, Alhaji Issifu P. Mohammad of the NDC won with 17,058 votes, Mr Richard Ofori Dwamena of the NPP had 13,608 votes, Mr Dominic Kwabena Anomah an Independent Candidate had 2,218 votes, Mr Raymon Abuska of the PNC had 324 votes and Mr Mathias N.G. Naala of the CPP had 240 votes. In the Okere Constituency, President Kufuor had 11,757 in the Presidential elections, Professor Mills had 6,140 votes, Dr Mahama had 75 votes and Mr Aggudey had 19 votes. In the Parliamentary, the incumbent NPP Candidate Mr Brandford Kwame Daniel Adu retained the seat with 10,902 votes, Ms Gloria Adu Nartey of the NDC had 6,867 votes and Mr Kwasi Akoto of the CPP had 643 votes. In the Ada Constituency in the Greater Accra Region, Professor Mills had 15,250 votes, President Kufuor had 3,721 votes, Mr Aggudey had 632 votes and Dr Mahama, 98 votes. In the Parliamentary, Mr Alex Narh Tettey-Enyo of the NDC won the seat with 15,039 votes, Mr Kabutey Caesar of the NPP had 3,787 votes and Mr Richard Ofotsu- Apronti of the CPP had 1,092 votes. In the Tamale Central Constituency, Professor Mills had 37,894 votes in the Presidential elections, President Kufuor had 19,832 votes, Dr Mahama had 654 votes and Mr Aggudey had 477 votes. In the Parliamentary, Professor Al-Hassan Wayo-Seini of the NDC had 35,635 votes and Mr Adam Mohammed Amin of the NPP had 24,614 votes, Dr Adam Gamel Nasser of the CPP had 2,574 votes, Mr Iddirisu U-Azu of the PNC had 693 votes and Ms Rita Adams of the DPP had 329 votes. In the Yendi Constituency, Dr Edward Mahama of the Grand Coalition (GC) obtained 626 rpt 626 votes; President John Agyekum Kufuor of the New Patriotic Party (NPP) had 15,782 rpt 15,782 votes; Professor John Evans Atta Mills of the National Democratic Congress (NDC) had 12,167 rpt 12,167 votes while Mr George Aggudey of the Conventions People's Party (CPP) got 142 rpt 142 votes. In the Parliamentary vote Alhaji Malik Alhassan, NPP incumbent Member of Parliament, retained his seat with 15,302 rpt 15,302 votes defeating NDC's Sulemana Ibn Iddrisu Baba, who had 12,263 rpt 12,263 votes. John K. Mborignam of PNC obtained 2,500 rpt 2,500 votes. In the Berekum Constituency of the Brong Ahafo Region Dr Mahama obtained 222 rpt 222 votes; President Kufuor, 29,345 rpt 29,345; Prof Mills 17,459 rpt 17,459 and Mr Aggudey, 329 rpt 329 votes. In Parliamentary race Captain Nkrabeah Effah Dartey (rtd), incumbent NPP Member of Parliament retained his seat with 32,259 rpt 32,259 votes defeating Stephen Oppong of NDC who got 19,073 rpt 19,073 votes. In the Tano South Constituency of Brong Ahafo Region Dr Mahama obtained 2,015 rpt 2,015 votes; President Kufuor 15,813 rpt 15,813; Prof Mills 12,550 rpt 12,550 and Mr Aggudey had 700 rpt 700 votes. In the Parliamentary Election Mr Andrews Adjei-Yeboah, incumbent NPP Member of Parliament retained his seat with 14, 521 rpt 15,521 votes defeating Mr Kwadwo Owusu Agyeman of NDC, who got 13,209 rpt 13,209 votes and Mr Frederick Boateng of PNC, who also obtained 1,992 rpt 1,992 votes. Provisional results from the Ahafo-Ano North Constituency showed that President Kufuor had 16,586 rpt 16,586 votes; Prof. Mills had 11,533 11,533 votes, Dr Mahama had 176 rpt 176 votes and Mr Aggudey had 92 rpt 92 votes. In the newly created Abirem Constituency in the Eastern Region, President Kufuor had 14,881 rpt 14,881 votes in the Presidential Elections. Prof. Mills had 6,345 rtp 6,345 votes, Mr Aggudey of the CPP had 216 rpt 216 votes and Dr Mahama had 150 votes. In the Parliamentary, Miss Esther Obeng Dapaah of the NPP won with 11,632 rpt 11,632 votes; Mr Yaw Agyei Frimpong of the NDC had 5,551 rpt 5,551 votes; Dr William Boakye Akoto and Independent Candidate had 4,408 rpt 4,408 votes; Mr Francis Essem of the PNC had 198 rpt 198 votes and Mr Godfred Dodzie of Every Ghanaian living Everywhere (EGLE) had 92 rpt 92 votes. In the Subin Constituency, President Kufuor had 45,251 rpt 45,251 votes in the Presidential Elections, Prof Mills had 15,033 rtp 15,033 votes; Dr Mahama had 467 rpt 467 votes and Mr Aggudey had 251 rpt 251 votes. In the Parliamentary, Mr Samspon Kwaku Boafo the incumbent NPP Parliamentary Candidate, retained the seat with 42,335 rpt 42,335 votes; Mr Abraham Kwesi Mensah of the NDC had 11,007 rpt 11,007 votes, Mr Charles Kofi Hagan an independent candidate had 4,805 rpt 4,805 votes, Mr Godfried Kofi Appiah of the CPP had 1,591 votes and Mr Huseini Aminu Ali of the PNC had 845 votes. In the Presidential elections in the Upper Denkyira West Constituency, President Kufuor had 12,072 votes, Professor Atta-Mills had 3,339 votes, Mr Aggudey had 260 votes and Dr Mahama had 170 votes. In the Parliamentary, Mr Benjamin Kofi Ayeh of the NPP had 12, 177 votes, Mr Kwaku Oduro-Bonsu of the NDC had 5,445 votes and Mr Thomas Maxwell Aidoo of the CPP had 395 votes. In Ledzokuku Constituency President Kufuor won with 38,100 rpt 38,100 votes, Professor Atta Mills had 37,386 rpt 37,386 votes, Dr Mahama, 571 rpt 571 votes and Mr Aggudey, 416 rpt 416 votes. In the Parliamentary elections, Gladys Norley Ashitey of the NPP won with 33,039 rpt 33,039; Nii Nortey Duah of the NDC had 32,169 rpt 32,169 votes, Emmanuel Nii Ashie, Independent Candidate, 10,523 rpt 10, 523 votes; Trebi Sampson Nii Ashiyey, CPP, 512 rpt 512 votes and Ebenezer Nii Otu Anang of the PNC, 431 rpt 431 votes. The NDC won the Presidential Election in the Odododiodo Constituency with 35,489 votes rpt 35,489; followed by the NPP, 32,046 rpt 32,046 votes; PNC, 483 rtp 483 votes and CPP, 425 votes. Samuel A. Mankattah won the parliamentary slot for NDC with 35,634, rpt 35,634; Reginald Nii Bi Ayi- Bonte, the incumbent MP, received 31,546, rpt 31,546 votes and Isaac Nii Annan M. Offei of the CPP, 814 rpt 814 votes.